I am not one for rain. I dislike it very much. However, when it’s 47 degrees and raining, and we have feet of snow outside that needs to disappear, I absolutely love it. I don’t even mind running in it. I went out for my regular 3.5 mile run. It started raining around the midpoint and I didn’t mind at all. I was dressed very light, much lighter than I’ve been. I wore two shirts, very light gloves (which I tucked into my waist 1 mile into the run), and my new Hind capris! I found these babies yesterday at TJ Maxx. I love that store. I might have to get another pair because I love them so much. I finished my run 30 minutes, 3 seconds (8:35 min/mile pace). There were times that I felt like I was absolutely sprinting, but the Garmin told me I definitely was not. I must be a little tired from the 12.5 yesterday. When I came home, it was Ward’s turn for his long run. Today he and Joe ran 18 miles, in the rain. They will rock the Sugarloaf Marathon in May! As soon as Ward got home, I made him shower, fed him some scones and made him come with me to Maine Running Company in Brunswick because I really wanted to by some racing flats. I know I did post that I wanted the Merrill Barefoot Trail Gloves, but the more I thought about it, the more it made more sense for me to transition to racing flats first. After I get better at running in racing flats, then I will take on the barefoot/minimalist approach. I do enjoy going to Maine Running Company because you can try out the shoes on the treadmill and they have a 21 day return policy. Plus, I have an issue with some bunions and I need to make sure my shoes have a wide toe box. I tried out the Nike Free, Asics Racer 8, and another pair I can’t remember. I did want to try on the Brooks Green Silence, but I they run very narrow so they were a definite no for me. I ended up the Asics Racers. They fit perfectly and felt extra light on my feet. I am planning a speed workout this week and I have a 5K on Saturday, so I’ll have a couple of opportunities to try them out. I also need to share that I did buy a Camelbak because our runs are getting longer and longer. When we trained for the half last summer/fall, we actually had to “stash” water along the rail trail and hope people didn’t mess with it! There was one time we just took our debit card with us and stopped at a corner store in Hallowell. The Camelbak will take away all those worries. I tried it out on the run yesterday, but I did get rid of it at the halfway point when we stopped at my house to take layers off because I had too much water in it and the sloshing around kind of bothered me. I suppose I could have just dumped some out, but I didn’t really feel like I needed any more water anyway. Next time I’ll just put in less water. Enjoy the rest of your Sunday night! We went to LL Bean on Saturday. 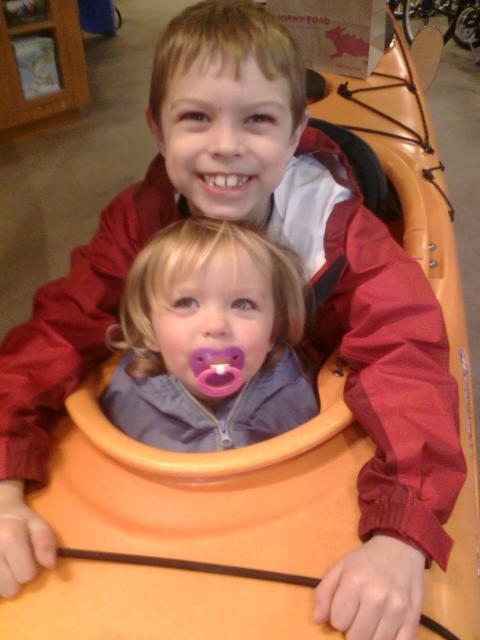 Izzy and Tucker loved getting in the kayak to pose for this pic! Love the new shoes! Asics are the way to go!